The most advanced pool-cleaning machine yet. Pool cleaning has come on a very, very long way since the days when people scooped leaves off the surface with a net and attacked the pool floor and sides with a long-handled brush. When your pool has digitally controlled lighting, an automatic chemical dosing system and the pumps and heaters are all controlled from a custom built pool control panel you need a method of pool cleaning that is up-to-date and effective. 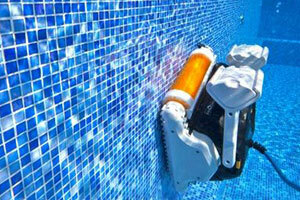 The new Dolphin Explorer automatic pool cleaners use advance cleaning technologies to keep pools clean and hygienic. It is probably the most intelligently designed pool cleaner you can buy.